Harper has been SO good! She is just like her parents - she LOVES the beach! We have a lot of laundry, mail, work to catch up on but in the next few days I'm going to do a little vacation recap. Feel free to skip these posts but I want to be able to remember our first vacation with Harper. Hope you all have had a wonderful week! P.S. I am going to postpone this week's SHOW US HOW YOU LIVE until next week. Sorry for the short notice but I just don't think I could get it together in time. Come back next week for some wonderful recipes!!!! I love the pics of Harper, she is beautiful! How cute! Looking forward to hearing how the vacation went. Sneaky, sneaky! Glad ya'll had a good trip. Wanted to suggest a recipe share for what you take to a family who has just had a baby or lost a loved one. I know I have some good, quick, and easy casseroles for this but just looking for something different. Hope your next few days are good (it's always hard to get caught up after a vaca). Beautiful pictures. I'm glad Harper did so well for you on your vacation. I'm looking forward to your recap. Welcome back home. I'm so glad you guys got away! I LOVE the beach... I would live there if I could! That's awesome that you took Harper as well. I remember taking Baylee for the 1st time at that age and then again when Blair was that age! They both love it. WONDERFUL pictures! Glad you had a break and hopefully you had a wonderful time! I think it is wonderful that Harper is such a great traveler! Can't wait to read more about your trip!! At least now, I have my recipe post waiting!! Looking forward to it! I'm glad y'all had a fun trip! I can't wait to read all about it. If those pictures are a little preview of what's to come, then I can't wait to see the rest of them! Harper looks so precious! That was smart! I recently heard of a pastor from somewhere posting on his blog about going on vacation and they ended up getting robbed. I'm very careful about what I say on my blog...well, WHEN I blog! Can't wait to hear about your trip! Oh! Those pictures are awesome! Isn't her outfit just perfect for beach pics?!? yes, you little sneak! And I'm glad you are (for safety sake). We get to go to Gulf Shores in a short while, not saying when either. Please tell us about the restraunts you tried. You are very wise to guard your privacy .. glad to hear it. What beautiful pictures of a beautiful family!!! Seriously, can I hire ya'll to take some pics of us the next time we are there?!?! I hope you had a great vacation! Thank you Jesus for time away and with our families! It means more now with babies than ever!!! I love the pictures of Harper on the beach - so cute!!! Adorable beach pictures. i will look forward to more. You are very smart to not tell the world you are gone! WELCOME HOME! Glad you're back. I had a sneaking suspicion you were gone, your posts just weren't the same. Welcome home!! Smart move on waiting to share the vacay ;) Harper is beautiful on the beach. We just posted pictures of Lauren's first time at the beach too! Just LOVE, LOVE, LOVE your blog!!! You are so blessed and have so much going for you! God is good! Looks like you had a wonderful trip! Harper looks adorable as always! For some reason I just knew you were at the beach! We were there there from last Thursday until Monday and I was hoping to run into you! I hope you guys had fun! I just did our vacation recap on our blog. Such cute pics! Hope you had a great time!! Good for you!Can't wait to hear more about the vacation,looks like y'all had a fun time! Very smart of you to keep it quiet! I'm so glad y'all had a good time and that Harper did so well! LOVE the pics and you all look beautiful!! ooh-la-la that beach baby is too cute for words!!! Kelly where did you get Harpers outfit??? Must know! Your pictures are amazing! How fun to take Harper to the beach! that little dress is darling. absolutely perfect! What a sweet picture with her name in the sand. Love it! Amazing photos (as usual)!!! Which reminds me...how is that light screen Scott built working out? And do you have any other baby photo tips you'd like to share? Love all the precious pics of your family at the beach...hope it was a wonderful trip! We are taking our sweet girl to the beach for the first time next week and seeing your pictures made me soooo excited! So glad you had a wonderful time!! 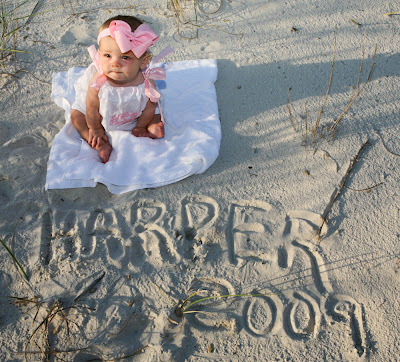 I LOVE LOVE LOVE that pic of Harper with her name in the sand!!! Can't wait for the vacation posts!! great family photo and harper looks adorable! aren't y'all the sneaky ones!! Love love love those pictures!! So cute!! SUCH cute pics! You have a beautiful family! Looking forward to the recap of sweet Harper at the beach! Don't blame you a bit for keeping it hush hush! Wonderful pics! She's such a cutie! I just posted a prayer request on my blog if you're interested in checking it out. I know you get a lot of requests, but wanted to let people reading know. I certainly believe in the power of prayer! I'm glad ya'll had such a good time in Gulf Shores! I go to Destin every year. I love the beach! What a great family pic of ya'll and I love the pictures of Harper! She is a doll! I am so glad that y'all had a great trip! The family picture on the beach is so cute! OH, Kelly, what great pictures of Miss Harper sitting on the sand.The one with her name could be your album cover for this beach trip. Scott looks good in his pink shirt. And you look great as usual. Can't blame you about the security issues. Did you think about someone house sitting for you, especially when you are on your mission trip. Scott is so computer savy he could set up timers for lights to come on in the house at odd times to make people think you are home. My parents did this when gone to Alaska for 3 months. It worked. Take care of that beautiful baby! Oh Kelly, Harper just gets cuter and cuter! I love her sweet outfit and her big pink bow! So precious! I'm glad you had a wonderful "technology free" vacation! Looking forward to hearing more about it! Very smart of you to think of security first. The pictures are wonderful! I can't wait to hear more about your trip. Beautiful pictures!!! Love Harper's outfit. Cant wait to hear all about your trip! Good for you, vacations are so nice. I love the picture of Harper in the sand. Welcome Home. Beautiful baby...gorgeous family. Glad you had fun this past week, Kelly!! The pictures are fabulous! I'm so glad you had a great vacation!! I suspected that you were at Gulf Shores. Can't wait to hear about your vacation recap! We were there at the same time! I hope your beach trip was as good as ours! It rained quite a bit though, but it's hard not to have a good time there! Did you go to Desoto's?! That is our favorite...and we ate brunch @ Palms Restaurant in Orange Beach & it was really neat! Kind of off the beaten path. So glad you had a fun time at the beach! The picture of all three of you together is a KEEPER, as are the ones of Harper by herself. What a living doll! She's precious! Glad you guys were able to get away!! I can't wait to hear how Harper's first beach vacation went! I thought something was amiss, you didn't blog as much, and I missed ya'll. But, I'm very glad you got away for vacation. Can't wait to hear more about it. Harper looks adorable! I'm glad y'all had a good time! I love Gulf Shores for a quick escape-away. Well, its not so quick anymore, now that I live in the Dallas area, but when I lived in Mississippi (almost my whole life) it was only a 6 hour drive. Can't wait to see more pictures and hear all about the trip. I think this might be my favorite "Harper outfit" so far. Welcome back Kelly! I have never been so I am looking forward to hearing more about the Gulf shores. Your pictures so far are adorable! Where in the world did you get that dress for Harper??? LOVE your trip pics! They are breathtaking! Esp. the ones of her on the beach. How cute with her name written in the sand! We went to Gulf Shores when my son turned 1. Some of my most precious memories of him are there,crawling all over the beach in a "bear walk" pose, eating sand and sporting a little mohawk from the suntan lotion in his hair! :) Can't wait to hear about your trip and where you ATE! awe, looks like you guys had a blast! My daughter wore a dress almost exactly like that for our beach pictures...too cute! Precious pictures! I am looking forward to hearing more about your vacation! I can't wait to take our first vacation with Benjamin in November! These pictures are so cute! You have an adorable family! I know this is a little late, but Target and the Children's store both have sleepers for babies bigger than 9 months old. I got some cute thermal pants/top outfits for $6.99 at target this past weekend and Children's store (if you have them) has their footed pj's (up to 4T) for $8 right now. thought i'd let you know b/c I know you were looking for some! What a great family picture of you all and adorable shots of Harper. I love the pix when you wrote her name in the sand. Very cute. I am going to remember that for when we have kids. Also could I ask where you got the white t-shirt with ruffles you are wearing? I've seen you in the grey one too and just love them. Thanks. I FINALLY was able to see my first Gulf Shore beach in FL this summer and let me tell you - Gulf Shore beaches don't compare to any others in the world. SO JEALOUS! That "Harper 2009" photo is adorable... it could be in a magazine!! HI Kelly! I read your blog but this is my first post! I just thought it was too funny because I was in Gulf Shores last week too, and as I walked into Hope's Cheesecake, I wondered if you were going to be visiting there while you were there...turns out we could have seen each other! Glad you had fun! Had to send the link to Harper on the beach to my friend who lives in Key West. She just had her first grandbaby--(a girl!) and I thought that photo of Harper was priceless!!! So glad you had time to get away!! Looks like it was a beautiful vacation! I hope you had a great trip!!! Gulf Shores is such a great family place. I can't wait to see more pictures. How wonderful Kelly! You are very wise and discerning to protect your family life! It looks like the beach was so restful and renewing for your beautfiful family! Great pictures and happy for you!!!!!! I am loving Harper's dress!!! Can't wait to see more beautiful beach pics! Oh my goodness, that last picture of Harper is ADORABLE! Glad you had a wonderful vacation. The pictures look great!! Can't wait to see more!! You have a beautiful family!! She is so precious! Looks like you had a GREAT time! Love the pics and welcome back!! Love the pink, white, and khaki! Cute photos. I guess I always forget how fortunate I am to leave near the beach. I remember when we moved to CO for a couple years, I met people there that had NEVER seen the beach in their life - it blew my mind! Glad y'all had a great trip. Can't wait to see more. I love Harper's outfit! She is just too precious! I wanted to let you know, in case you didn't already, Ann Taylor Loft has some really cute ruffle tops this fall. Awww, I love those pics of Harper! I go to Gulf Shores every summer! It's so fun! Great pictures--can't wait to see more photos of your trip! We vacation in Gulf Shores, too ~ but not often enough. Cute pics!!! Beautiful beach pictures, Kelly! I can't wait to hear more about your vacation! I Luv the pictures of harper... they are just so precious! That is so funny you had to land in Waco.. Well not that funny, but you know what I mean. I was born and raised in Waco and only moved to Houston 3 years ago where my husbands job is. ALL my family is still there and actually I was home when you were on the runway and hanging out in the airport. I wish I would have known, I could have come for a visit and brought you some diapers and wipes. =} I love the beach pictures of you and your family and I really think you should use the picture of the 3 of you for your Christmas cards this year. Just a thought. I had a flight like that at Christmas last year with a 6 month old. It was kind of scary of a while. There where a lot of mom's and kid's on that flight. Glad you got home safely. Very sneaky!! But I like it!! It's good to be sneaky under those circumstances!! Have NEVER thought of writing in the sand for a picture like that - great idea! !